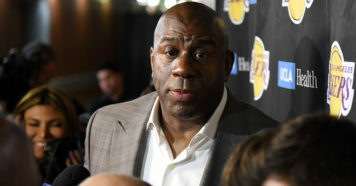 That’s what Lakers president of basketball operations Magic Johnson said in an interview with Sirius XM NBA Radio when asked about LeBron James’ role with the team. James is currently leading LA in points, assists, rebounds and steals per game and the Lakers have relied on him heavily in their 14-9 start. Considering that James has the highest usage rate among all qualified Lakers and has generated the most points off assists for the team this season, it’s hard to see how this situation isn’t like a repeat of Cleveland — despite what Magic might say. When James arrived in Los Angeles during the offseason, one of his goals was to build a contender that would last. The Lakers enticed him with the young core of Lonzo Ball, Brandon Ingram, Kyle Kuzma and Josh Hart. Outside of the prospects of immediate contention in Philadelphia or Denver, this might have been the best young core James could’ve joined. While LA’s youngsters were ready to take the next step, there’s always an adjustment period during LBJ’s first year with a franchise. The 2010-11 Heat started 9-8 before rattling off lengthy winning streaks. The 2014-15 Cavaliers were 20-20 before going on a 33-9 tear. With that in mind, are the young Lakers actually adjusting to playing with James? Kuzma has been one of the primary beneficiaries of James’ arrival. The forward is getting closer to the basket more often and taking advantage of his opportunities there. Kuzma’s percentage of assisted makes has also skyrocketed from last season. 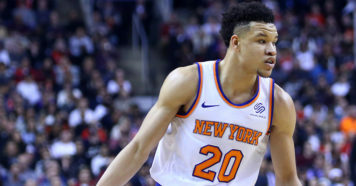 According to basketball-reference.com, 64.6 percent of his 2-point makes and 97.8 percent of his 3-point makes are assisted. Kuzma’s usage rate is basically the same as last season and he’s taking the same amount of shots. Hart has also fit with James almost instantly. Because he provides the most reliable 3-point shooting of the Lakers’ core, Hart has received great looks playing with James. 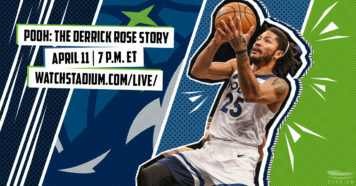 He has proven his ability to handle defenders at multiple levels, adding to his utility, and while his efficiency from behind the arc hasn’t changed on a macro level (he’s is shooting 39.6 percent, the same as last season), he’s taking more quality 3s, according to NBA.com/stats. Since Hart has come off the bench to begin the season, he hasn’t gotten the same amount of run with James as Kuzma, Ingram and Ball have. Despite this, Hart and James are the top two-man lineup among the group. Every two-man lineup featuring a member of the young core with James has a positive net rating, which is a massive plus for the Lakers. Although Ingram and James might not equate to anything of value with a 0.1 rating, they aren’t a net negative. As for Ingram, he’s had a rough start with LeBron. Ingram’s numbers are down across the board and his 3-point shooting ability has taken a huge hit from last season. His low free-throw percentage is also an issue because of his desire to attack the rim. Because Ingram doesn’t make a major impact creating for others or rebounding on the defensive end, his scoring ability is paramount. When you break it down, you see that part of Ingram’s problem is positioning. James and Ingram both play at small forward, but the latter has had to move into the backcourt. This has immensely impacted Ingram’s efficiency and shot selection. One of Lakers head coach Luke Walton’s biggest challenges going forward will be finding a way for Ingram to mesh with James. Ball has also faced an adjustment with James taking over as the lead ball handler. His usage rate and assist rate have dropped, but his turnover rate has gone up. Ball is also taking 3-pointers on almost 50 percent of his shots, but he hasn’t been an efficient shooter at the NBA level. Because Ball’s biggest asset on offense is his court vision, his skills are somewhat duplicated with James’. On defense, Ball has remained steady despite a minor slump at the beginning of the year. Overall, the young core has taken the right steps defensively during the Lakers’ dominant November run. The Lakers have a relatively tough December slate with three instances of three games being played over four days. Los Angeles will also play eight of its 14 remaining contests from this month on the road. This is a great opportunity for the young core to take another step forward while James continues to play lighter minutes. Theoretically, James’ workload will increase after the All-Star break as the team gears up for a playoff push. Will the young Lakers be ready to carry their weight as well?